I say “interesting” for one very specific reason – this perception, a perception that appears to be widely held, shouldn’t exist. Adopted in 1913 and ammended 36 times in the last 101 years, The REALTOR® Code of Ethics has 17 Articles, with a variety of “Standards of Practice” that define behaviors inside each article. It’s not a difficult code to read in it’s entirety. Nor is it difficult to understand. And, quite frankly, the gist of the code is summed up very well in the preambe and in the main language of the Article 1. 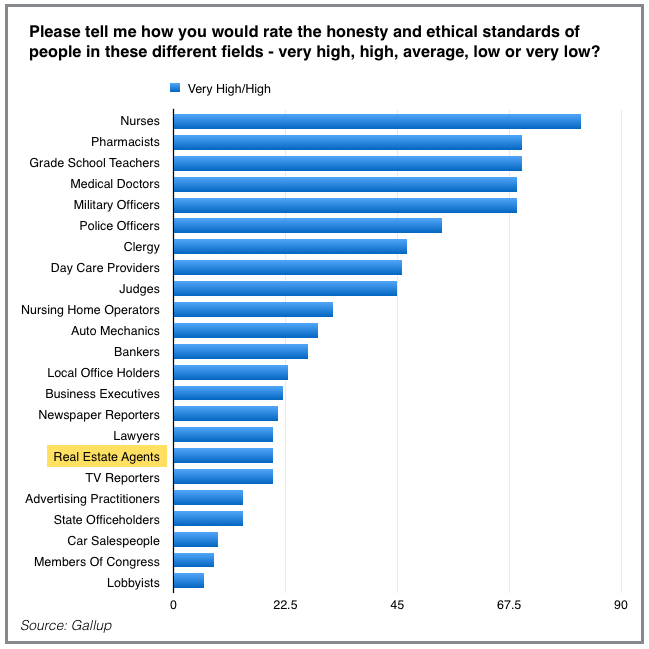 On average, 1 out of every 4 people polled by Gallup since 1977 would rate the ethics and honesty of real estate agents as “low or very low.” The highest it has ever been is 1 out of 5. I suppose that would be fine if the other 3 or 4 were rating them very high, but they are not. Year after year, the results show real estate agents with a vast majority of people polled placing their trust levels below mediocre. And while I have shared from stages in the past that this is partly a result of the internet’s impact on authority that was once based in the tightly-held possession of MLS data, the numbers have been basically the same since 1977. The internet is not the culprit and the problem is not new. The widely held set of beliefs about what REALTORS® deliver and how they deliver it, as validated by the experience of everyone with whom they come into contact, The REALTOR® brand, is not what the REALTOR® Code of Ethics would like it to be. Whose responsibility is it to fix that? This is a conversation that almost got started on Twitter during the NAR Association Executives Institute Conference in Baltimore a few days ago. @AndreaRealtor local leadership has to be willing to fight for the penalties required to enforce values. Hard to get buyin at scale. “There is a difference between core values & NAR code of ethics. Values can be applied locally.” You can only say so much in 140 characters. And what I meant by that is that local associations have the ability to develop accountability for a set of values that augment the code if they choose, but the code reads pretty clear to me. Where does accountability have the greatest chance of success? Surely not at the national level. It has to take place on the ground. “Many times it ‘seems’ that the most successful are the ones who follow the code least often.” It doesn’t have to be this way. If rules are written by a body and not proactively enforced by the body, then the rules never really existed to begin with. Correct? Whether its Realtors, Finance, Medicine, Politics, Police, or Lawyers, each of these organizations should find benefit in locating internal bad behaviour and presenting to the world. One of my questions, Mike, and I have more questions than answers, is if the enforcement is not made public, how is the public supposed to know that enforcement is taking place. I hear about enforcement quite a bit, but it’s all behind the scenes.The COE seems to be a pretty damn high bar. So, I don’t think the bar needs to be raised in real estate, unless that’s not really the bar. I read it and think, “wow, this is a damn good set of rules to follow. I would trust that group of people.” And, quite frankly, the REALTORS® I know, and I know more than the average bear, jump over that very high bar quite easily. An old Japanese proverb says that “A Vision without a plan is a dream, and a plan without a Vision is a nightmare.” What turns visionless plans into nightmares is that plans conceived in that manner are typically reactionary and opportunistic – not wise and purposeful. They emphasize and reward short term results. They turn organizations into transaction driven entities. When that happens, an organization’s Values – driven by the Values of its leaders – are supportive of transaction driven results that reward instant gratification and ignore long-term implications. All of that serves to attract people and create cultures (Values in action turned inward) that bend the rules to achieve short term results. Like abandoning integrity and trust in order to achieve higher sales and profits (think Toyota and General Motors); or abandoning integrity and ethics in order to grow membership and increase organizational power (think teachers’ unions). Jeff, you mentioned somewhere in your writing that you know a lot of Realtors that more than live up to the Code of Ethics established by NAR. I do as well. But those are people who never needed that written Code to begin with. They would live their lives and conduct themselves that way with or without a written code. Codes of Ethics, in almost every organization that has one, are written for people who need them because that’s the only way they’ll conform to that level of behavior. And the only way that they will continue to conform, is for the Code of Ethics to have real teeth in them for those that choose not to conform. When the accountability and the consequences of non-performance get soft or cease to exist, the Code of Ethics becomes a sham. And when an organization’s leadership tempers enforcement of the Code because it might reduce membership or popularity or conflict with some political agenda then the leadership has sold out. And then you get the United States Congress.